The R18RT Ground Glider offers the most impressive carrying capacity and load handling capability of the entire RocknRoller® Multi-Cart® line, and instantly transforms into any of 8 configurations to help you move massive amounts of equipment with ease. Super wide R-Trac 8”x3” front casters with brakes and 10”x3” rear wheels easily roll heavy loads over grass, dirt, and soft carpet. The custom-designed R-Trac Ground-Glider Wide wheels feature low profile no-flat tires, lightweight but strong polymer hubs, low rolling resistance, pneumatic-like cushioning, vastly wider load dispersion over soft terrain, and look like racing wheels. 8”x3” brake casters are 50% wider than typical casters and R-Trac 10”x3” rear wheels are 33% wider to glide over soft terrain but keep the cart lower to the ground for better loading ergonomics and smaller storage size. 25% larger tubing on the frame bed and foldable handles is stronger for even bigger loads. Extremely tough textured powder coat finish survives thousands of trips. Non-skid frame bed surface resists load slippage. Now you can easily roll your gear across rough terrain - at a job site, backyard wedding, over gravel or grass, at an outdoor festival, sporting event, or just about any condition you can imagine. Specifications: Powder-coated steel tube frame telescopes from 42"-60" in length with 32"/20" (front/rear) foldable sides 14" wide frame bed 10"x3" R-Trac wide no-flat rear wheels and 8"x3" R-Trac wide no-flat swivel casters with brake Load cap. : 700 lbs./32 cu. ft. Wt: 38 lbs. 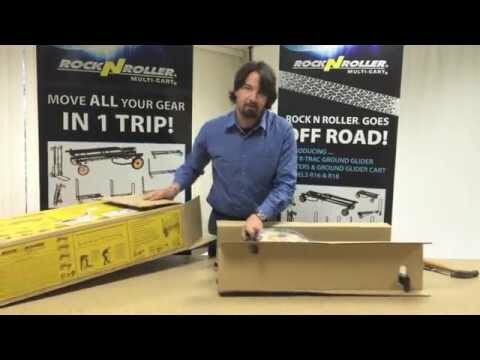 Do you own Rocknroller Multi-Cart R18RT Ground Glider Mega or have you had a chance to try it? Tento největší ale také nejtěžší model je díky své konstrukci na profi úrovni. Má obrovskou nosnost a nebude trpět na přetížení. Použité kovové profily jsou nejvíc robusní z celé řady. Zřejmě díky tomu vydží sloužit řadu let.